Well known entertainer, Michael de Pinna, is best known for his antics as the anti-hero in Vodacom’s much loved “Yebo Gogo” series. But there is much more to Michael than his leopard-print clad character would have us believe! Not only is Michael a respected and sought-after entertainer actor and singer; many are fast recognising the natural flair that Michael has for genuine hospitality and fabulous décor. With Michael’s background in five-star accommodation, Michael grew up travelling nationally and internationally with his father a five-star Hotelier. As a result it seemed only natural to open his own home, and carry on in the family tradition of hospitality. Michael de Pinna’s beautiful home in Atholl, Gauteng is a reflection of himself. de Pinna’s Self Catering Cottage is located in popular Atholl, close to the Wanderers Club, The Inanda Club & upmarket Melrose Arch. Only small or elderly pets are accepted at the discretion of de Pinna’s Self Catering Cottage management. de Pinna’s Self Catering Cottage is comfortably located between Gauteng’s largest business centres. When needing business accommodation between Sandton and the Johannesburg inner city then the location of de Pinna’s Self Catering Cottage compliments both and with the growing business area of Rosebank, Sandton and Melrose Arch on your door step. Our self-catering cottage is situated close to the James and Ethel Gray Park where a full day of weekend fun awaits you. Walk your dog and swing like Tarzan through the trees. Rope swinging, during the week Wednesday to Sunday. This park is a bird sanctuary. The Emmarentia Botanical Gardens are a great favourite for the garden enthusiast with beautiful indigenous formal style garden arrangements. If you looking for something less formal but just as beautiful the Walter Sisulu National Botanical Garden would be a day well spent. Many picnic areas and plenty bird life. You don’t need to break your gym routine while travelling. de Pinna’s accommodation is close to several branches of both Virgin Active and Planet Fitness Gyms. When you need accommodation close to Morningside Mediclinic, Rosebank Clinic, Linksfield Clinic, Sandton Clinic or Millpark Hospital then de Pinna’s Self Catering Cottage is your place. If you are visiting a family member or friend in hospital and need to stay over or if you are spoiling yourself to some cosmetic surgery, there is no more relaxing accommodation than de Pinna’s Self Catering Cottage. de Pinna’s Self Catering Cottage is also located close to many wellness centres, hair & beauty salons, nail bars, aesthetic & skin renewal clinics and day spas. Accommodation located close to several shopping centres. Melrose Arch – Killarney Mall – The Rosebank Mall – Hyde Park – Sandton City – The Blu Bird Shopping Centre, & Thrupps Centre. Dis-Chem – Woolworths – Checkers – Pick ‘n Pay – Thrupps – and Spar Grocery stores all within driving distance. BirdHaven Shopping Centre for beautiful home-wear – art gallery – eclectic gifts – restaurants – pharmacies and convenience stores. Soweto Tours include visits to various Landmarks such as Vilikazi Street, Mandela House, the Apartheid Museum and the Hector Pietersen Museum. The James Hall Museum of Transport, located just South of the City Centre has the largest collection of transport in South Africa. Constitution Hill and Liliiesleaf are rich in history and also art. The Adler Museum of Medicine preserves the history of the health sciences and is very interesting. Casino’s to visit – The Montecasino in Sandton – Emperors Palace in Kempton Park near the Or Tambo International Airport, and Gold Reef City Casino and Theme Park in the South of Johannesburg. Airports available in Johannesburg Sandton – OR Tambo in Kempton Park in the East of Johannesburg, and Lanseria International Airport in the West of Johannesburg. Popular Theatres in Johannesburg: The Joburg Theatre in Braamfontein – The Market Theatre in Newtown – The Auto and General Theatre on The Square in Sandton – The Teatro and Pieter Toerien’s Theatres at Montecasino and The Theatre of Marcellus at Emperors in Kempton Park and The Barnyard Theatres. Hospitals nearby: The Morningside Clinic – The Sandton Clinic – The Rosebank Clinic – Mill Park Hospital – The Linksfield Clinic – Sunninghill Hospital. 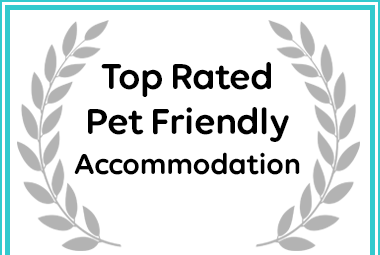 Afristay has named de Pinna's Self-Catering Cottage as a Top Pet-Friendly, Johannesburg (Joburg) Self-Catering Destination.